vOneCloud can manage an unlimited number of vCenters. Each vCenter is going to be represented by an vOneCloud host, which in turn abstracts all the ESX hosts managed by that particular instance of vCenter. The suggested usage is to build vOneCloud templates for each VM Template in each vCenter. The built in scheduler in vOneCloud will decide which vCenter has the VM Template needed to launch the VM. If resources are imported in vOneCloud rather than created through it, they won’t be deleted in vCenter if deleted in vOneCloud. vOneCloud will create a special key at boot time and save it in /var/lib/one/.one/one_key. This key will be used as a private key to encrypt and decrypt all the passwords for all the vCenters that vOneCloud can access. Thus, the password shown in the vOneCloud host representing the vCenter is the original password encrypted with this special key. To avoid misunderstandings, there are two VM templates we will refer to: the vOneCloud VM Templates and the vCenter VM Templates. The formers are created in the vOneCloud web interface (Sunstone), whereas the latter are created directly through the vCenter Web Client. 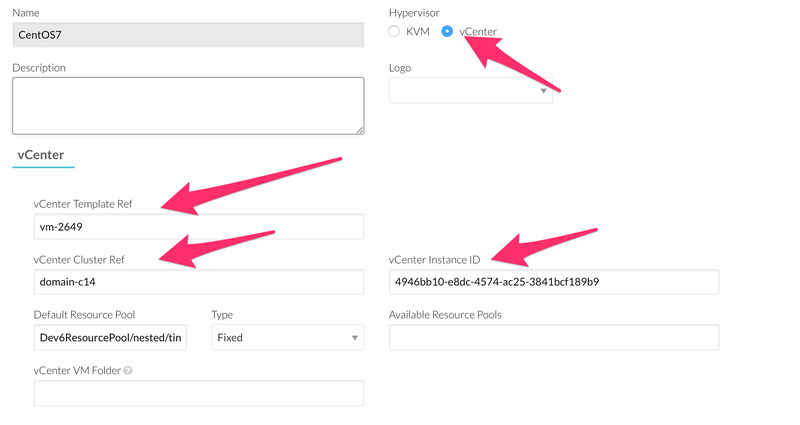 A cloud administrator builds two vOneCloud templates to represent one vCenter VM Template available in vCenterA and another available in vCenterB. As previous work, the cloud administrator creates two vCenter VM templates, one in each vCenter. You can import a vCloud VM Template using the Import button and providing your vCenter’s hostname or IP address and the credentials for a user with the required privileges. Then, select the templates you want to import and click the Import Selected Templates button. Create one VM Template with informaton about host vCenterA. Repeat for vCenterB. If a user instantiates one of these templates, the vOneCloud scheduler will pick the right vCenter in which to instantiate the VM Template. Using the automated process for importing vCenter infrastructures, vOneCloud will generate the above template for you at the time of importing vCenter. The following advanced features can be used in the VM Templates and VMs. At the time of deploying a VM Template, a flag can be used to create a new VM Template out of the VM. 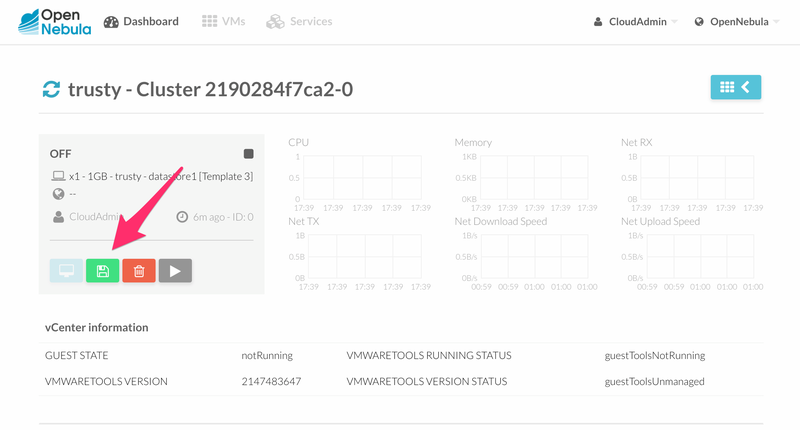 Whenever the VM life-cycle ends, vOneCloud will instruct vCenter to create a new vCenter VM Template out of the VM, with the settings of the VM including any new disks or network interfaces added through vOneCloud. Any new disk added to the VM will be saved as part of the template, and when a new VM is spawned from this new VM Template the disk will be cloned by vOneCloud (ie, it will no longer be persistent). This functionality is very useful to create new VM Templates from a original VM Template, changing the VM configuration and/or installing new software, to create a complete VM Template catalog. A new vOneCloud VM Template will be created pointing to this new VM Template, so it can be instantiated through vOneCloud. This new vOneCloud VM Template will be pointing to the original template until the VM is shutdown, at which point it will be converted to a vCenter VM Template and the vOneCloud VM Template updated to point to this new vCentre VM Template. After a VM has been launched, end users in Cloud View can chose to save a VM into a VM Template, provided the VM is in poweroff state. A new VM Template will be created that, upon instantation, will hold all the changes performed to the original VM at the time of hitting the Save As Template button. For example, if you have the following directory tree and you want VMs to be placed in the VMs folder under Management, the path to that folder from the datacenter root would be /Management/VMs. You can use that path in different vOneCloud actions e.g when a template is imported. VM disks can be resized at booth time of the VM, or when the VM is powered off. VM Disks can be saved as images for later use when the VMs are powered off, the option is present upon clicking a particualr VM and proceeding to the Storage subtab. In vOneCloud, a new VM is deployed when a clone of an existing vCenter template is created, that’s why vOneCloud requires that templates are first created in vCenter and then imported into vOneCloud. In order to activate the linked clones functionality VM Templates must be imported through the ‘’onevcenter’’ command line tool, as this functionality is not present through the web interface. To achieve this login into the appliance and then use the onevcenter tool as described here, answerying ‘’yes’’ when prompted if you want to use linked clones. 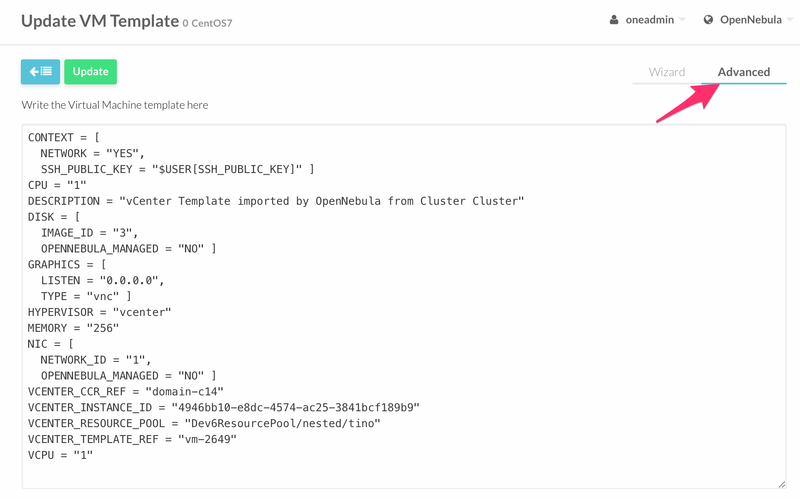 This operation will modify the template so you may prefer that OpenNebula creates a copy of the template and modify that template instead, the onevcenter tool will allow you to choose what you prefer to do. 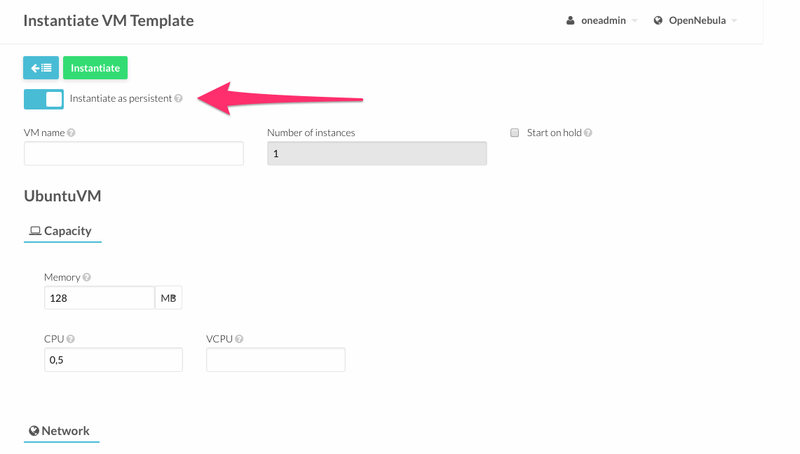 The vOneCloud scheduler will pick a valid datastore for a VM, unless the VM Template defines a datastore. To assign a VM Template to a datastore, proceed to the Scheduling tab on the VM Template update dialog and select the desire datastore in the Datastore requirements section. NIC Valid MODELs are: virtuale1000, virtuale1000e, virtualpcnet32, virtualsriovethernetcard, virtualvmxnetm, virtualvmxnet2, virtualvmxnet3. GRAPHICS Multi-value - Only VNC supported. SCHED_REQUIREMENTS NAME=”name of the vCenter cluster where this VM Template can instantiated into a VM”. VCENTER_RESOURCE_POOL By default, VM will be deployed to the default Resource Pool. This attribute allows to set the name of the resource pool where this VM will be deployed. This can be overwritten explicitly at deployment time from the CLI or Sunstone. More information here <resource_pool> . Virtual Networks from vCenter can be represented using vOneCloud virtual networks, where a one-to-one relationship exists between an vOneCloud’s virtual network and a vSphere’s port group. When adding NICs in a VM template or when attaching a NIC (hot-plugging) to a running VM in vOneCloud, a network interface can be attached to an vOneCloud’s Virtual Network. vCenter Networks/Distributed vSwitches for a particular vCenter cluster can be imported in vOneCloud after the cluster is imported using the same procedure to import vCenter clusters, making use of the Import button in the Network --> Virtual Networks tab in the vCenter View. Also, these two kind of networks can be created from vOneCloud. 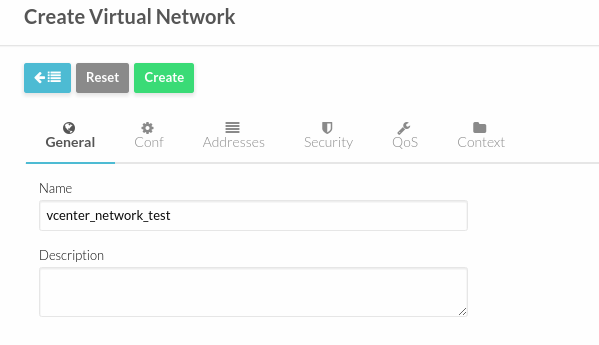 Create a new OpenNebula Virtual Network template. Add the required attributes to the template including the vOneCloud’s Host ID which represents the vCenter cluster where the network elements will be created. When the Virtual Network is created, vOneCloud will create the network elements required on each ESX host that are members of the specified vCenter cluster. 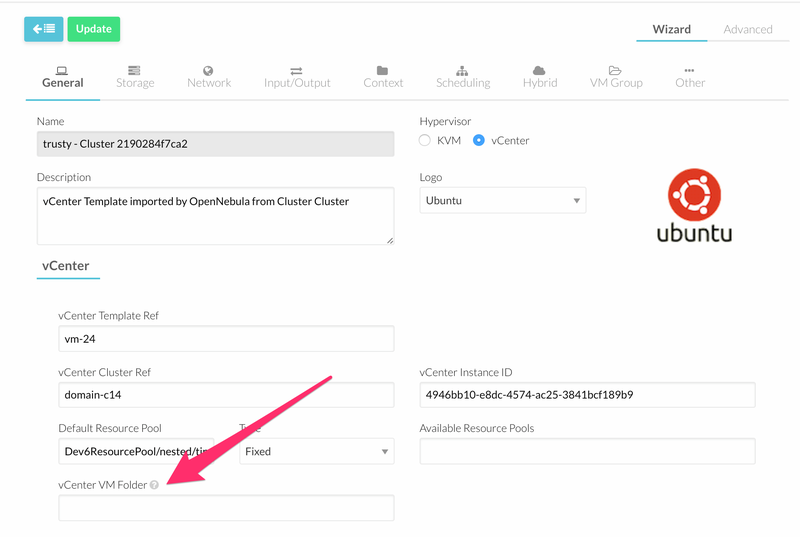 The Virtual Network will be automatically assigned to the vOneCloud cluster which includes the vCenter cluster represented as an vOneCloud host. vOneCloud network creation works asynchronously so you may have to refresh the Virtual Network information until you find the VCENTER_NET_STATE attribute. If it completes the actions successfully that attribute will be set to READY and hence you can use it from VMs and templates. If the network creation task fails VCENTER_NET_STATE will be set to ERROR and the VCENTER_NET_ERROR attribute will offer more information. When a Virtual Network is removed, for each ESX host found in the vCenter cluster assigned to the template, vOneCloud removes both the port group and the switch. If the switch has no more port groups left then the switch will be removed too. If a port group or switch is in use e.g a VM is running and have a NIC attached to that port group the remove operation will fail so please ensure that you have no VMs or templates using that port group before trying to remove the Virtual Network representation. You’ll need to enable the network hooks for network creation to work. BRIDGE string Yes It’s the port group name. PHYDEV string No If you want to assign uplinks to your switch you can specify the names of the physical network interface cards of your ESXi hosts that will be used. You can use several physical NIC names using a comma between them e.g vmnic0,vmnic1. Note that two switches cannot share the same physical nics and that you must be sure that the same physical interface name exists and it’s available for every ESX host in the cluster. This attribute will be ignored if the switch already exists. VCENTER_ONE_HOST_ID integer Yes The OpenNebula host id which represents the vCenter cluster where the nework will be created. VCENTER_SWITCH_NPORTS integer No The number of ports assigned to a virtual standard switch or the number of uplink ports assigned to the Uplink port group in a Distributed Virtual Switch. This attribute will be ignored if the switch already exists. MTU integer No The maximum transmission unit setting for the virtual switch. This attribute will be ignored if the switch already exists. VLAN ID is set to 0, which means that no VLANs are used. MTU value is set to 1500. Number of ports is set to Elastic. According to VMWare’s documentation, the Elastic mode is used to ensure efficient use of resources on ESXi hosts where the ports of virtual switches are dynamically scaled up and down. In any case, the default port number for standard switches is 128. Security - Promiscuous mode is set to Reject, which means that the virtual network adapter only receives frames that are meant for it. Security - MAC Address Changes is set to Accept, so the ESXi host accepts requests to change the effective MAC address to other than the initial MAC address. Security - Forged transmits is set to Accept, which means that the ESXi host does not compare source and effective MAC addresses. Traffic Shaping policies to control the bandwidth and burst size on a port group are disabled. You can still set QoS for each NIC in the template. Physical NICs. The physical NICs used as uplinks are bridged in a bond bridge with teaming capabilities. Number of ports is set to Elastic. According to VMWare’s documentation, the Elastic mode is used to ensure efficient use of resources on ESXi hosts where the ports of virtual switches are dynamically scaled up and down. The default port number for distributed switches is 8. Static binding. When you connect a virtual machine to a distributed port group, a port is immediately assigned and reserved for it, guaranteeing connectivity at all times. The port is disconnected only when the virtual machine is removed from the port group. Auto expand is enabled. When the port group is about to run out of ports, the port group is expanded automatically by a small predefined margin. Early Bindind is enabled. A free DistributedVirtualPort will be selected to assign to a Virtual Machine when the Virtual Machine is reconfigured to connect to the port group. In the Conf tab, select vCenter from the Network Mode menu, so the vcenter network driver is used (the VN_MAD=vcenter attribute will be added to OpenNebula’s template). The Bridge name will be the name of the port group, and by default it’s the name of the Virtual Network but you can choose a different port group name. Once you’ve selected the vCenter network mode, Sunstone will show several network attributes that can be defined. Several different Address Ranges can be added as well in the Virtual Network creation and/or Update dialog, pretty much in the same way as it can be done at the time of acquiring the resources explained in the Import vCenter guide. Verify that Network I/O Control is enabled. Verify that the virtual machine system traffic has a configured bandwidth reservation. Four values can be used in both the Virtual Network Template or the NIC to achieve traffic shaping. Take into account that only total traffic (inbound and outbound) is limited, the minimum between inbound and outbound is picked. Minimum between INBOUND_AVG_BW and OUTBOUND_AVG_BW. Expressed in kilobytes/second, this value is used to set the Reservation. This value cannot be set to a greater value than the Peak_BW. Minimum between INBOUND_PEAK_BW and OUTBOUND_PEAK_BW. Expressed in kilobytes/second, this value is used to set the limit, or maximum bitrate for the interface of the VM. This value cannot be less than 1024 kilobytes/second. vOneCloud gathers network monitoring info for each VM. Real-time data is retrieved from vCenter thanks to the Performance Manager which collects data every 20 seconds and maintains it for one hour. Real-time samples are used so no changes have to be applied to vCenter’s Statistics setings. Network metrics for transmitted and received traffic are provided as an average using KB/s unit. 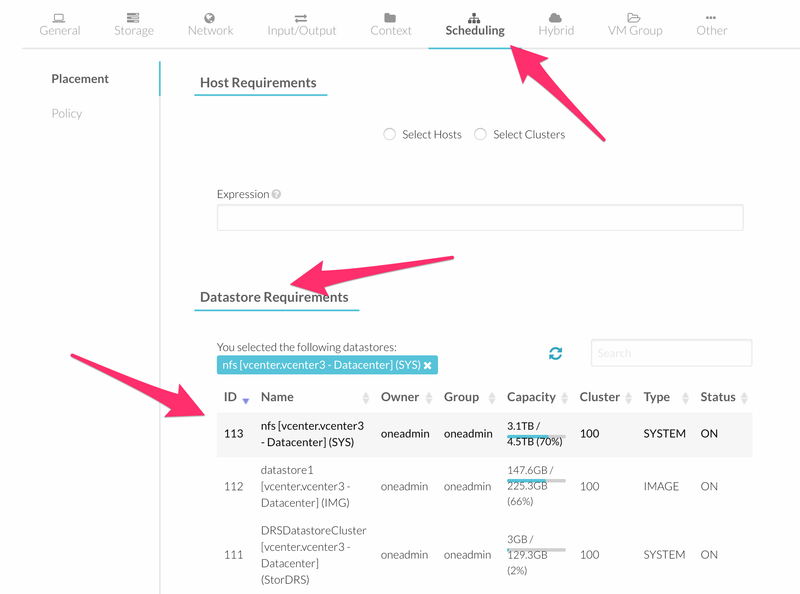 Datastores for a particular vCenter cluster can be imported in vOneCloud after the cluster is imported using the same procedure to import vCenter clusters, making use of the Import button in the Storage --> Datastores tab. In order to create a OpenNebula vCenter datastore that represents a vCenter VMFS datastore, a new OpenNebula datastore needs to be created with the following attributes. This can be achieved using the ‘+’ sign in Storage --> Datastores tab. VCENTER_ADAPTER_TYPE Default adapter type used by virtual disks to plug inherited to VMs for the images in the datastore. It is inherited by images and can be overwritten if specified explicitly in the image. Possible values (careful with the case): lsiLogic, ide, busLogic. More information in the VMware documentation. Known as “Bus adapter controller” in Sunstone. VCENTER_DISK_TYPE Type of disk to be created when a DATABLOCK is requested. This value is inherited from the datastore to the image but can be explicitly overwritten. The type of disk has implications on performance and occupied space. Values (careful with the case): delta,eagerZeroedThick,flatMonolithic,preallocated,raw,rdm,rdmp,seSparse,sparse2Gb,sparseMonolithic,thick,thick2Gb,thin. More information in the VMware documentation. Known as “Disk Provisioning Type” in Sunstone. VCENTER_DS_REF Managed Object Reference of the vCenter datastore. Please visit the Managed Object Reference section to know more about these references. VCENTER_DC_REF Managed Object Reference of the vCenter datacenter. Please visit the Managed Object Reference section to know more about these references. VCENTER_INSTANCE_ID The vCenter instance ID. Please visit the Managed Object Reference section to know more about these references. VCENTER_USER Name of the vCenter user. All OpenNebula datastores are actively monitoring, and the scheduler will refuse to deploy a VM onto a vCenter datastore with insufficient free space. Adding a new datastore and representing existing VMDK images enables disk attach/detach functionality. 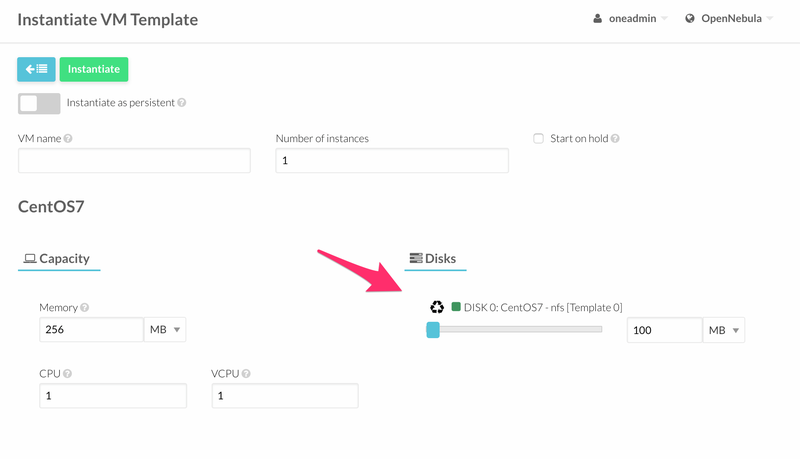 vCenter VM Templates with already defined disks will be imported without this information in vOneCloud. These disks will be invisible for vOneCloud, and therefore cannot be detached from the VMs. The imported Templates in vOneCloud can be updated to add new disks from VMDK images imported from vCenter (please note that these will always be persistent). ADAPTER_TYPE Possible values (careful with the case): lsiLogic, ide, busLogic. More information in the VMware documentation. Known as “Bus adapter controller” in Sunstone.